• Provide and improve communication access for individuals living on the streets in all communities. • Engage with and maintain an active, involved volunteer base that consists of businesses, nonprofits, and individual community members all working together to enhance family communication and the life experience, possibly decreasing homelessness. • Create a system of service delivery through collaboration and sharing of best practices among our communities’ volunteers. • Partner with the private sector, corporations, and foundations to expand service capacity and funds. You can help. 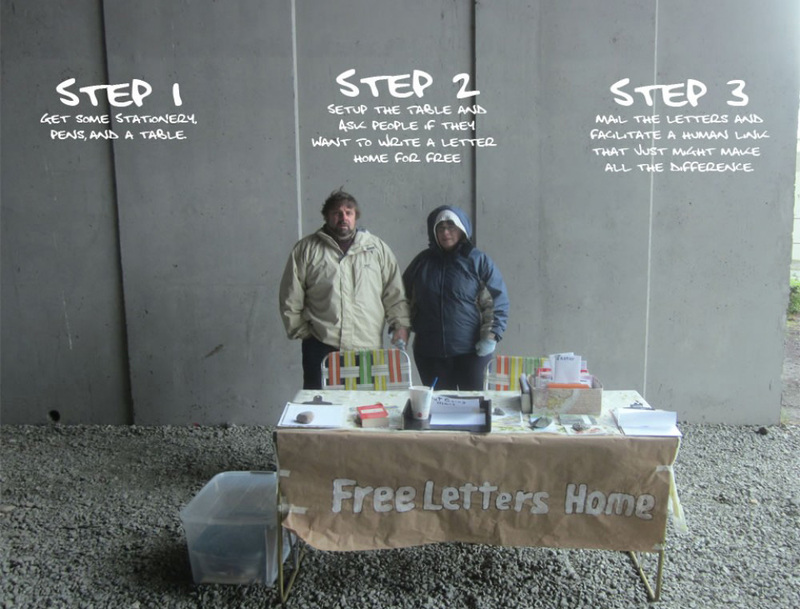 Please help spread the word about Free Letters Home. If you have one, please share us on your Facebook page. My daughter and I just got back home from our first “Free Letters Home” set up, and it was truly an interesting experience. We attended the Dothan, AL “Homeless Stand Down/Connect” sponsored by the Love In Action Ministries/Harbor Church. We met many people that worked to put this event together, and we met many of the homeless people that attended. Our “Free Letters Home” table was new to this community but everyone thought it was unique and it serves a need. Since many people did not have “addresses to mail cards” with them, we gave several people their choice of a card and a stamp to take with them. Everyone seemed grateful and asked when we would be back again. We plan to visit this same location the last Friday of every month, possibly more often. We may set up at other locations also depending on the needs of the people. I want to thank Sheila Stidham of Port Charlotte, FL for the lovely box of cards and envelopes she mailed to me. It was a complete surprise but VERY much appreciated! God Bless you, Sheila. Are you guys involved with Project Homeless Connect at Cascade High School? This year will be June 27th and what you do fits in so perfectly with all of the help and resources and services that are offered there for upwards of 1,100 or more homeless and at-risk people and families. Thank you for the Great idea and I too read about this in Guideposts. I was happy to see the Mill Creek, WA location in there and turns out we live right down Beverly Lane from you! I read the article to my daughter and will share it with our group at Faith Lutheran Church on Cady Rd as well. Thank you! Thank you for thinking about and suggesting how we can use our outreach in helping more people to keep in contact with their families. Yes, we have been a service provider at Snohomish County Project Homeless Connect at the high school for the past two years. We first heard about the event from reading a flyer under an overpass. We have also been service providers at other Homeless Connects including Tacoma, Skagit, Oregon, Minnesota, and Colorado. Thank you also for your encouragement and sharing with your daughter and your church. I help run the gift shop at our church in Punta Gorda, FL and our parishoners donate all their unwanted cards. Every once in a while we have to purge the cards that haven’t sold. I have a bag full of note cards & envelopes and would be more than happy to send them to you. If you can’t use them, maybe someone else might like them. E-mail me and let me know. Keep up the good work. All monies collected by our gift shop goes to our Outreach Programs in the area. We have made contact with Love in Action Ministries and hopefully they will allow us to set up at their location in Dothan. Will get out the cards ASAP. God bless you on your endeavor and hopefully, everything will work out for you. With God at the helm, it can’t fail. What an awesome concept. Please email information about organizing and running a project such as this. 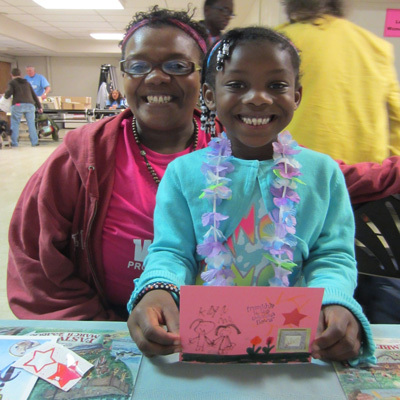 Thank you for letting us know about what you do in Guideposts! This is something I want to do with my 2 teenagers help! I was trying to get them involved in something other than themselves and their cell phones! Thank you for the GREAT idea!! God bless you all for this awesome work you do! I too read about you in Guideposts. God bless. I’m passing your Facebook page onto friends via my wall. Wonderful idea!! I am a school teacher retiring this year. I am cleaning out here at school and at home. I was wondering if I could send note cards and decorated paper tablets to anyone that could use them. Also, I suspect I could collect from others (teachers and students) who might have these items that they don’t use anymore. We serve the homeless at our church in Port Charlotte Fl.-one Sunday a month. We call it the Shower Ministry. We give them showers, food, clothes, haircuts and prayer.They also is done on 3 other Sundays at other places. This sure would be a wonderful added blessing. I would like any do’s or don’ts about how to start to run this. Be blessed. What wonderful idea. I’m about to retire and this would be a great thing to do at the local homeless mission. Any advise.. I will volunteering again a local heart hospital and of course spend as much time with grand children and some of my favorite past time activitoes. Such as golf and time at the target range. My wife will continue to work but together we could do the “write home free” adventure on weekends. Again, if you have any good advise or do’s and don’ts , please share with me. Thanks and great day! Wonderfull blog! It truly is wonderful and caught my interest. I will surely add this on my favorites list. Many Thanks for sharing.